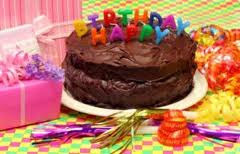 Faith's Firm Foundation: Birthday Freebies! And I have signed up for more! I have not yet confirmed whether my favorite restaurant, Olive Garden, has any freebies or not, however they are currently (as of today, August 19, 2010) offering in my area the "Never-Ending Pasta Bowl" with over 40 combinations for only $8.95! If you have growing boys, especially teenagers, at home, then this deals for you, Mama! (Make sure you check and confirm any offers listed below to see that they are available in your area. I did not have the time to call and check on each one of them obviously!) Freebies include: restaurants that give free meals with the purchase of a meal, free desserts, or a song and a free dessert, fast-food restaurants that give freebies, and places like Cold Stone Creamery and Culvers that give you free ice cream treats!! Fortunately, the offers are usually good for a couple of weeks or even for up to a month! So, how fun is that?!! Let me know of additions or corrections to this list that you know of, and I will continue to update it! Happy Freebie! Looks like you will be eating well on your birthday! I will gladly give you 10% off anything you want from my shops as a little birthday treat. Hope your day is great!!! Stephanie, Thankfully, I have a month to use the freebies--it wouldn't be pretty if I had to eat all of that in one day!! I also found out Benihana gives a $30 coupon, which will arrive in a week or two! I've never been there, but it sounds like a fun experience, where they cook your food at the table! That will be a "girls night out" because my husband doesn't like seafood, unfortunately. Thanks so much for the birthday gift of 10% off! You are so sweet! I'm sure I can find something wonderful, because I love your jewelry! Washington, DC, Here We Come!